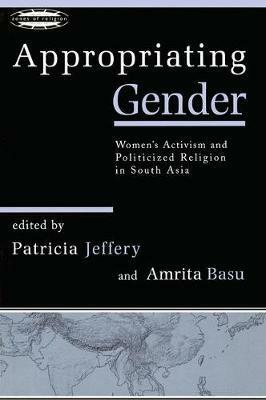 Appropriating Gender explores the paradoxical relationship of women to religious politics in India, Pakistan, Sri Lanka, and Bangladesh. Contrary to the hopes of feminists, many women have responded to religious nationalist appeals; contrary to the hopes of religious nationalists, they have also asserted their gender, class, caste, and religious identities; contrary to the hopes of nation states, they have often challenged state policies and practices. Through a comparative South Asia perspective, Appropriating Gender explores the varied meanings and expressions of gender identity through time, by location, and according to political context. The first work to focus on women's agency and activism within the South Asian context, Appropriating Gender is an outstanding contribution to the field of gender studies. This book explores the paradoxical relationship of women to religious politics in India, Pakistan, Sri Lanka, and Bangladesh. Contrary to the hopes of feminists, many women have responded to religious nationalist appeals; contrary to the hopes of religious nationalists, they have also asserted their gender, class, caste, and regional identities; contrary to the hopes of the nation states, they have often challenged state policies and practices. Through a comparative South Asia perspective, Appropriating Gender explores the varied meanings and expressions of gender identity through time, by location, and according to political context. This volume makes a very significant contribution to a growing literature on women, gender, and right wing politics in South Asia. Patricia Jeffery is a sociologist with a distinguished record in the field of reproduction. Amrita Basu is a political scientist known for her research on fundamentalism in South Asia.